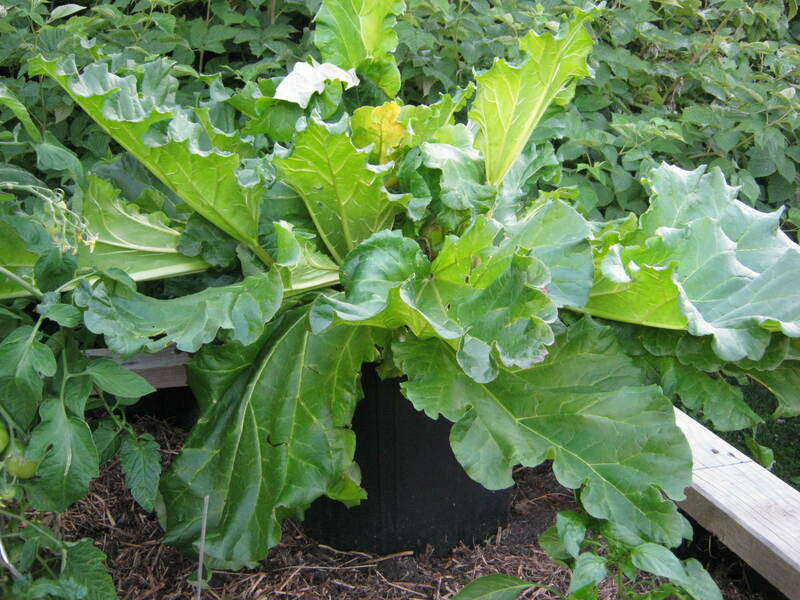 To grow rhubarb with really long stems, put a bucket round the crown. Cut the bottom out of the bucket first of course. As the leaves reach for the sunlight at the top of the bucket, so it forces longer stems, giving you a bigger harvest without using more garden space. It also reduces evaporation of moisture from sun and wind, which is good as rhubarb likes a lot of water and food. Feed with well rotted manure, sheep pellets or vegetable fertilizer. As it’s the leaf stem that you eat, it is actually a vegetable, not a fruit. Although the leaves are poisonous, they can be put in the compost. They can also be used to make an organic pesticide, but I don’t know any recipes. “See how my garden grows”. I have planted two more courgettes because often plants get powdery mildew and peter out before the season has finished, so by planting more latter, I hope to prolong the season. I planted peas and supported them with bamboo canes criss crossed. I put in snow peas (flat pods that you eat) and ordinary peas (that you pod). They are mixed in together and planted too closely, they are difficult to harvest. I won’t do that again. I’ll plant just one variety and space them according to the instructions on the packet. The snow peas haven’t got a lot of flavour, but are nice for something different. The red onions are looking grunty but I think they have a way to go yet. I poked my finger in the soil to feel round the bulb and it’s still quiet small even though the tops look big. I have been “stealing” some of the leaves to put in salads. Yum! We’ve had a good feed of radishes and I have sown more seed a couple of times. They’re a fast crop. The carrots and beetroot are coming along nicely and I have sown more of those too, for successive harvesting. We like eating the young beetroot leaves in salads and the bigger ones steamed, tastes like spinach. 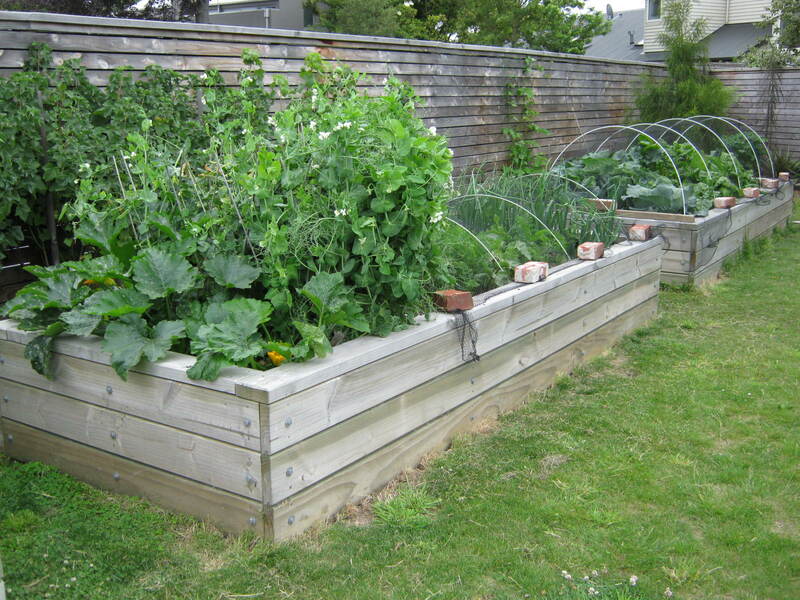 There has been lots of lush growth since the first photo of my vegetable garden at the end of October. 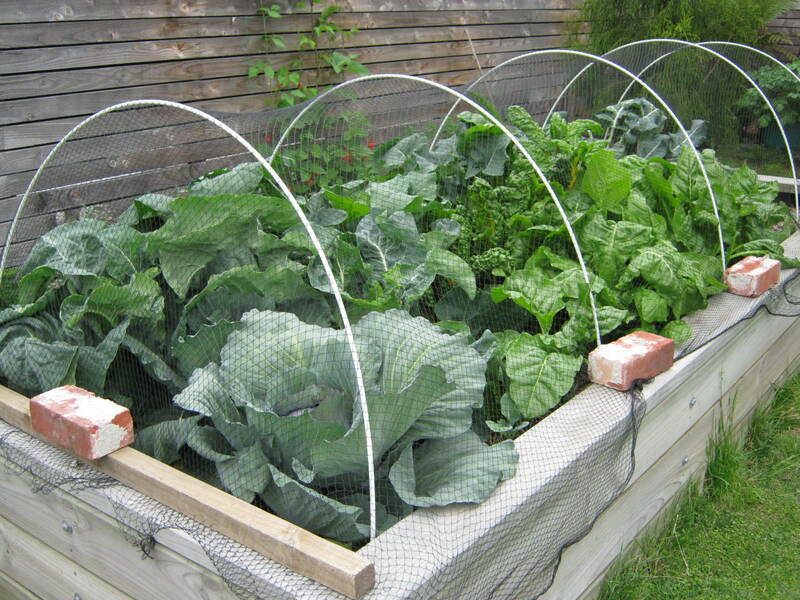 The brassicas and beets have all grown really well. On warm sunny days I have seen good growth in just one day. I have harvested brocolli (see my last blog), cauliflowers (the tops nibbled by slugs ruining the look of them but not affecting the eating), cabbages (nice and tight), and lettuces (not very big, not very good and riddled with slugs). I’m very pleased with that bed, it has produced well without too much watering. The silverbeet and spinach have grown quickly and been very tendered to eat. I have planted more caulis and brocollis and lettuces. With each plant, I put a big handful of manure in the planting hole to feed the seedling as it gets going. I don’t know why the lettuces have been so poor, I’ll have to work on that. I have put in another slug trap at the other end of the bed and hope to eventually drastically reduce the slug population. There don’t appear to be any snails. The first slug trap I use beer for bait which works well but attracks slaters as well. This second one I have put pellets in the bottom, so we’ll see how that goes. The bird netting is working well at keeping out the white butterfly. I often see them flying all round the plants trying to find a way in, but fail. Peastraw has been very successful too in keeping out the weeds, and reducing moisture loss. 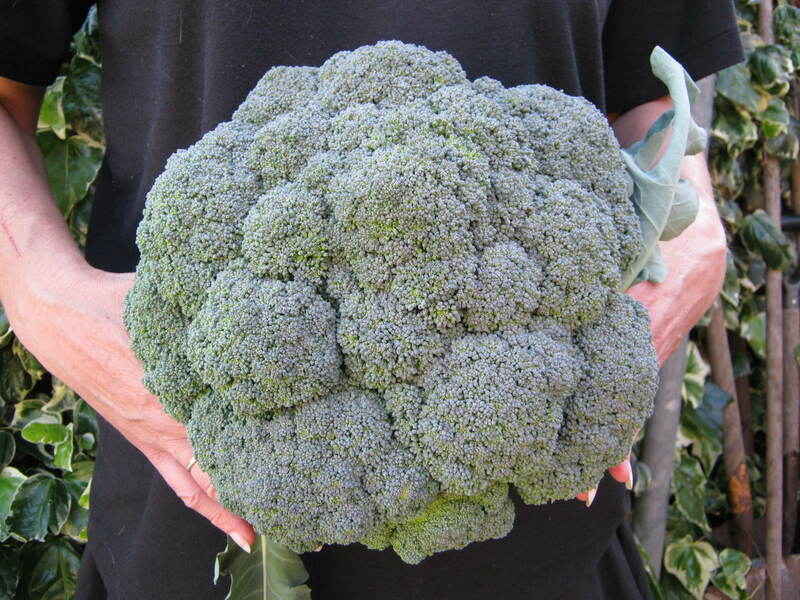 I picked this head of brocolli from my garden today. It weighed 1.450kg. I used plenty of well rotted manure in the soil before planting and then covered it with peastraw to retain the moisture. I didn’t have to water everyday which is just as well, seeing we have watering restrictions. 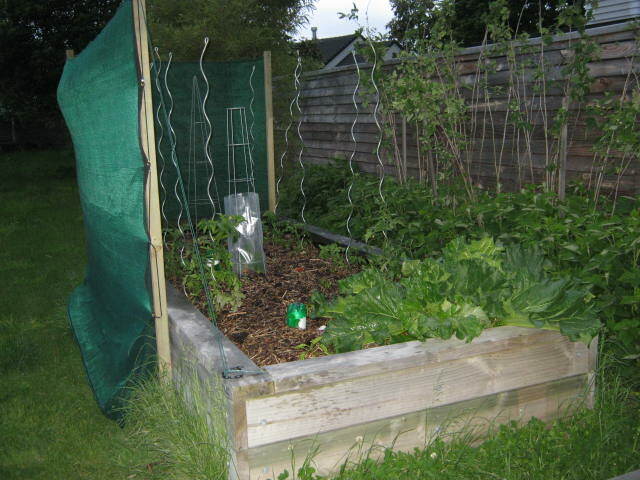 I covered the garden bed with birdnetting to keep off the whitebutterflys and it worked well. I’m very pleased with the result. This brocolli will feed the two of us for several meals. Always peel the brocolli stems particually the tough stalk. The inside stalk is very nice especially raw. In my opinion it is nicer and sweeter than the florets. I have left the plant in the ground as there are two or three side shoots that I will leave to see if they grow much more. I suspect not, probably just get tough. This trap is full of beer and is then dug in so the lip is level with the soil. 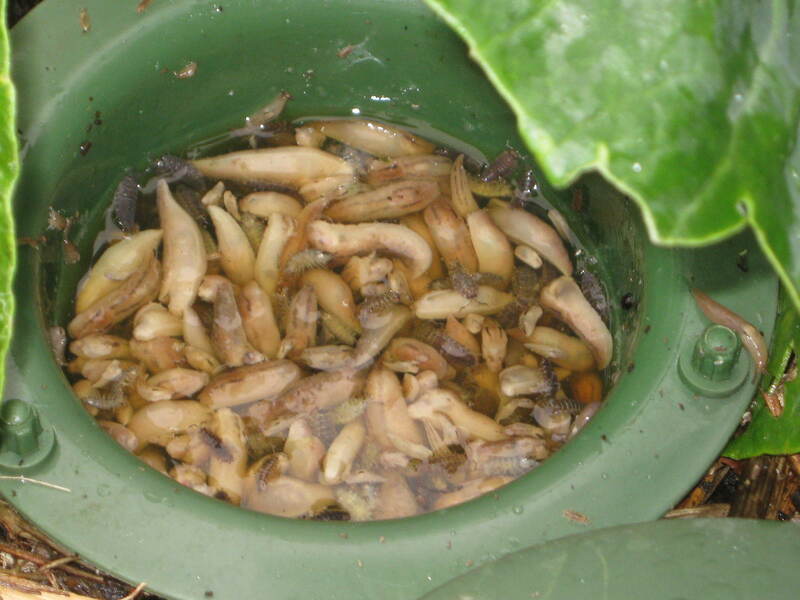 The slugs can slither easily into the bowl and for some reason seem to be attracted to the smell of the beer. When they go in, they get pickled and die. The lid that fits on top stops rain and irrigation filling the bowl and diluting the beer. Its simple but effective. It seems to have attracted alot of slaters also which is a shame. Slugs are a jolly old nuisance. I have often sprinkled around the garden lots of Quash Slug and Snail bait, but with limited success. It is a pet and wildlife friendly product but it does break down in rain or irrigation. Baysol is the only one that doesn’t break down in rain but is a lot more expensive. 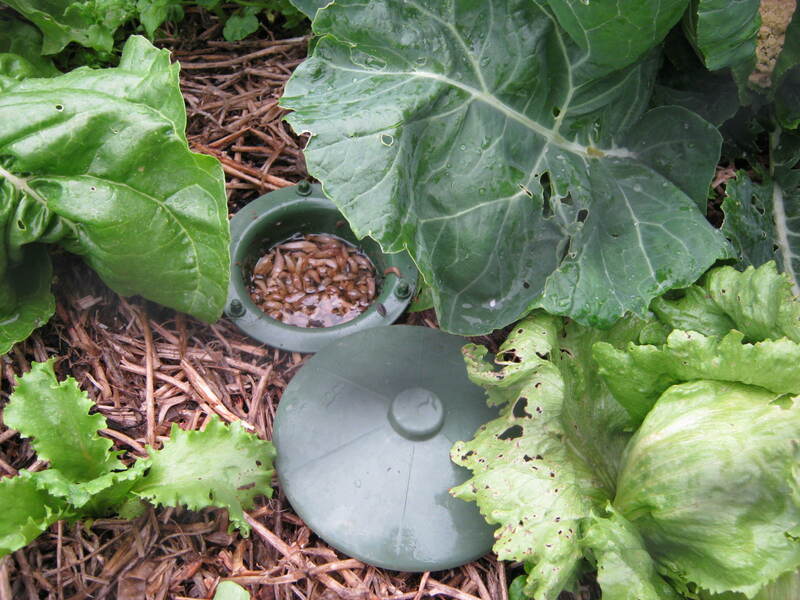 I recently tried one of these snail traps that you fill with beer. The first time I tried it, it was full of slaters which don’t do any harm in the garden, but when I emptied it, I discovered the bottom had a lot of slugs in it. I filled it again with beer (such a waste of beer according to my husband) and this time you can see for yourself in the photo, it is full of slugs. I am very pleased with the result. I hope it continues to be so successful. It hasn’t attracted any snails though! Maybe there aren’t any.